Let me just begin by saying I really do like this place. It’s comfortable, casual, and never disappoints. The food is fresh, sustainably sourced, and always delicious. Located across the street from Paesano’s, with Zocalo for its next door neighbor, The Press is in the space previously occupied by Dragonfly. I’d never been to Dragonfly, but I had heard the spot was a difficult one… I don’t see The Press going anywhere anytime soon. The menu is well designed, the prices aren’t outrageous, the ambience is pleasant, and most importantly, the service and food are superb. On this night, we had had the challenging task of figuring out a place to eat on a Saturday night, thanks to The Broiler debacle, and arrived around 8:45. The place was definitely packed, with a wait of about 45 minutes for a table. But we weren’t fazed. One of the genius things The Press has is seating at its bar, and the surrounding area. There’s a large community table that seats about 16, plus tables lining the window. A large party had just left the community table, leaving several spots available. This is a great place to sit and enjoy your meal… and who knows, you might end up meeting some new people, which is exactly what happened! After enjoying some time with our dates, and slyly eyeing what the others were ordering, we finally met the fabulous and uniquely named duo of Langston and Hirondina. Langston is named after the poet Langston Hughes, while Hirondina is named after a songbird native to Africa. So don’t be wary of community tables; they can be the source of some unexpected fun! Not only is the food fabulous, but the mixologists have created some artisan cocktails that you would be hard “pressed” (haha. okay. sorry) to find anywhere else. The Press menu is crafted so that you can enjoy a selection of tapas or appetizers, which include salads, soups, and items like crispy calamari, and gnocchi. They also serve their pasta in large or small sizes, in addition to full size entrees. This makes it perfect to mix up your meal and try a variety of dishes. Go for some tapas, a small pasta, and an entree. 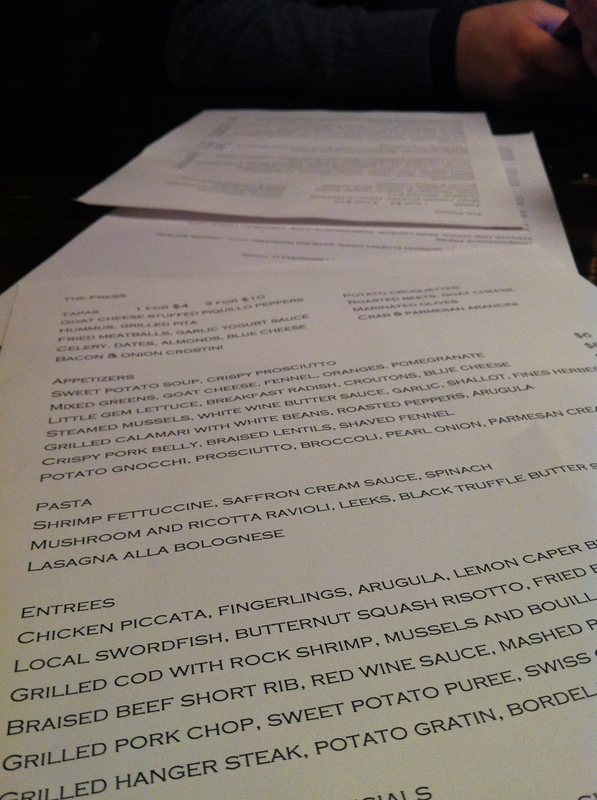 Or maybe two appetizers, and two small pastas… or one tapas and an entree! Mix it up, have some fun, and warn your taste buds they’re in for a treat! I definitely like their tapas menu which are 1 for $4 or 3 for $10. 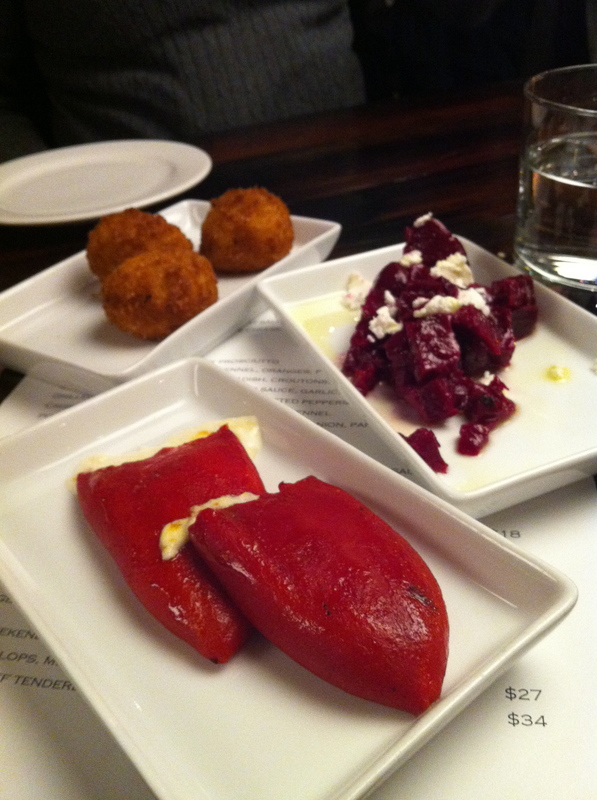 There are 9-10 things from which to choose… tonight was goat cheese stuffed piquillo peppers, crab and parmesan arancini, and roasted beets with goat cheese. They’re the perfect size to share between two people and serve as a fabulous appetizer. They also have other delectable dainties like bacon and onion crostini, marinated olives, and fried meatballs with a garlic yogurt sauce. The other thing I like about The Press is their ridiculously affordable house wine. 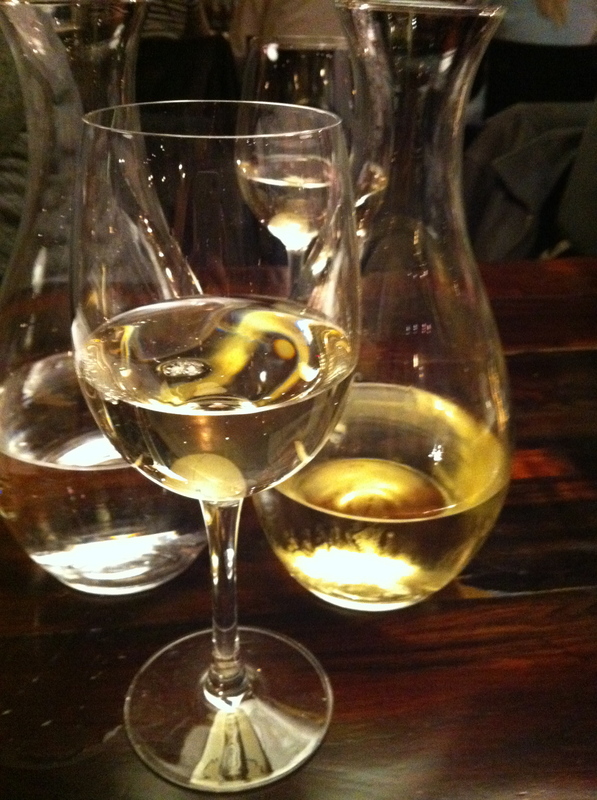 An entire 1 liter carafe of their house white is only $18 and is really quite tasty. I’m not as big of a fan of their red, but I definitely do like the white. 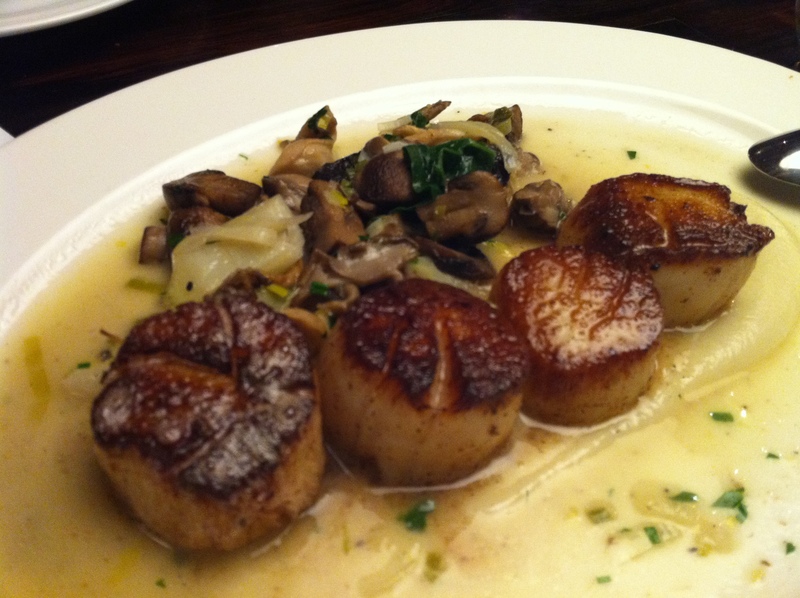 As for our entree, this was a no-brainer… pan seared scallops with mushrooms, sun choke puree, and truffle butter. A limited time dish specifically for Valentine’s Day, I’m definitely hoping this becomes a regular on the menu! The scallops were cooked to perfection, crunchy on the outside, thanks to the searing, and sweet and delicate in the middle. The mushrooms were crimini, shiitakes, and oysters… a trifecta of deliciousness! 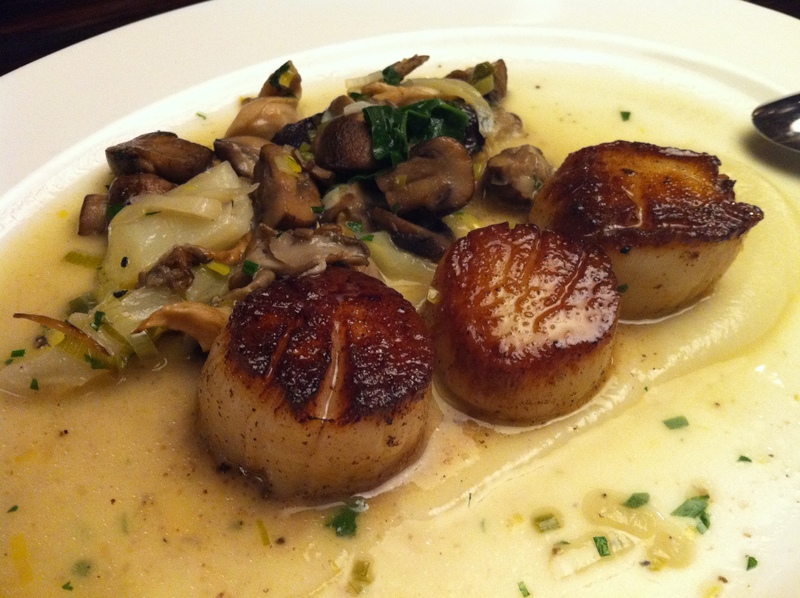 The meaty texture and flavor of the shiitakes, the medium firmness of the criminis, and the unique flavor and texture of the oyster mushrooms combined to make a perfect, umami-ful complement to the scallops. Pulling it all together was a sun choke puree that I could have eaten on toast! The black truffle butter with a hint of fennel, chives and leeks, brought the entire dish to an inhumane level. Okay, that may be hyperbole, but I thoroughly enjoyed this dish. 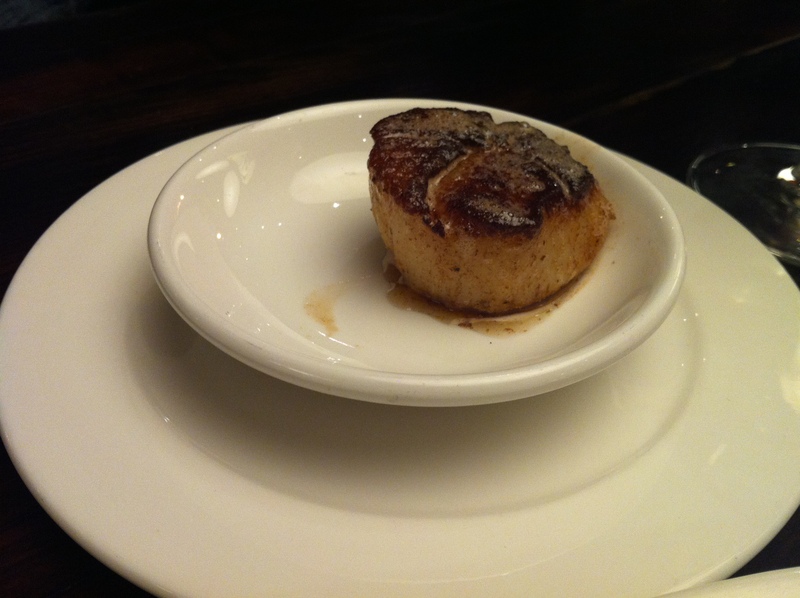 I judge a restaurant on its scallops and The Press passes with flying colors! The only criticism I have is that I wanted some thick bread, like focaccia, to sop up the sauce! But we were missing one! So we got a lone scallop delivered to us. In’t it cute? You can't escape my evil clutches! The whole family… dish complete! The complete family of four. 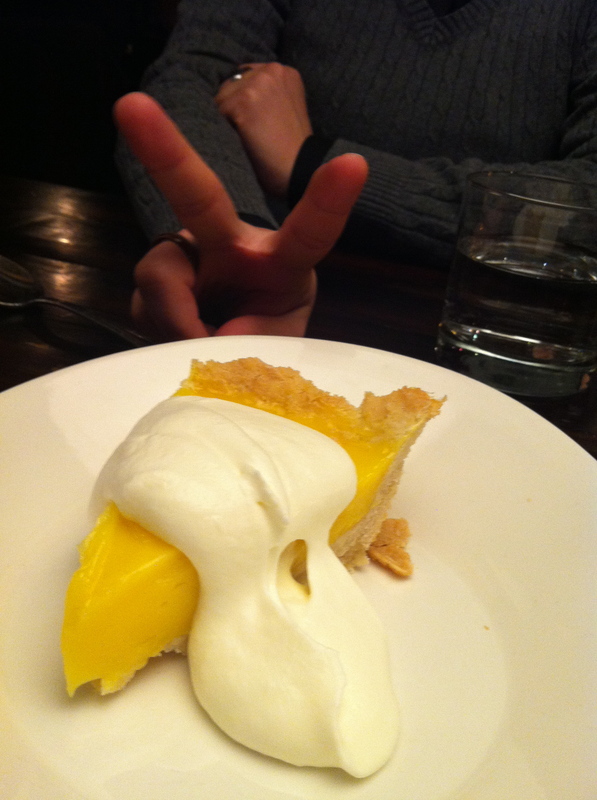 For dessert, meyer lemon pie with whipped cream. This did not disappoint. It was tart, yet sweet. The whipped cream added a nice smoothness and neutrality to cut through any residual tartness you may feel on your tongue. I judge pies and pizzas based on the crust… this was one of the best crusts I’ve had. To drink with this, we had two drinks: a Domaine Fontanel Rivesaltes Ambre and a Ben Rye ’07. The former was all caramel and burnt sugar. The latter, in one word, delicious. It was all apricot and reminded me of a fruit roll up. Made from the Italian varietal called the zibbibo, it is similar to a muscato, so is quite sweet and a wonderful aperitif. I loved this. Obviously. Langston and Hirondina ordered the other dessert we were eyeing, winter citrus creme brulee, and were kind enough to let us try it. This was really awesome. It had the traditional crunchy top, but the custard had the flavor of a lemon cake, with the smooth texture of pudding, yet was firm enough to stand up to the crunch. There was a dance of burnt orange and sugar flavors. The vanilla custard was taken to a different level with the delightful zing of citrus to make this no ordinary creme brulee! 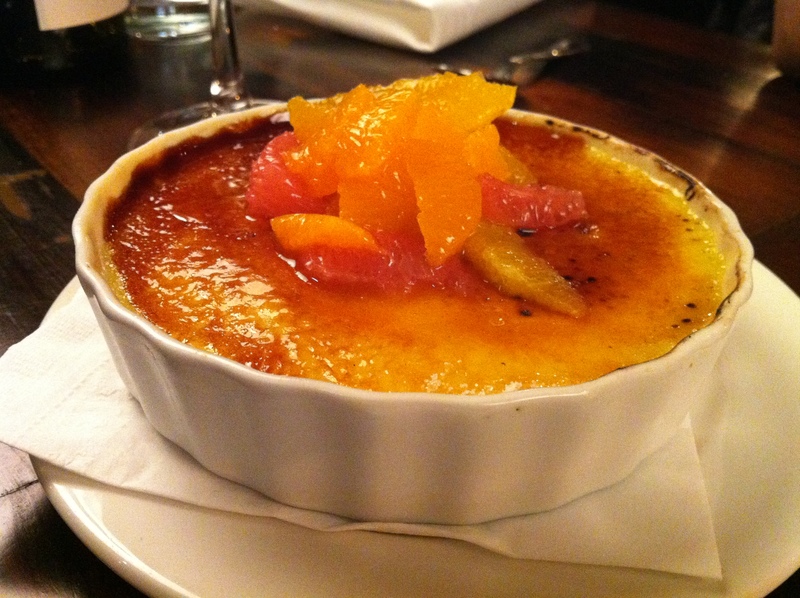 I kind of think that the acidity of the citrus cut through the fat of the creme brulee, kind of like how a sauvignon blanc does that with higher fat dishes. Bottom line, I love this place. Be sure to sit outside when the weather gets nice. Oh, I should add that once when I was there, Mayor Kevin Johnson and Michelle Rhee were also having dinner! I guess they know the good places, too! The owner/chef wanders the dining room, making sure everyone is enjoying their meals, but he is also in the trenches cooking and delivering food to tables! They don’t have a happy hour right now, nor are they open for lunch, and are closed Mondays. Reservations aren’t available online, but they generally do take them over the phone. They also have a special 3-course dinner on Sunday for $25 a person, 5-9. I’m hoping to try this some day soon! 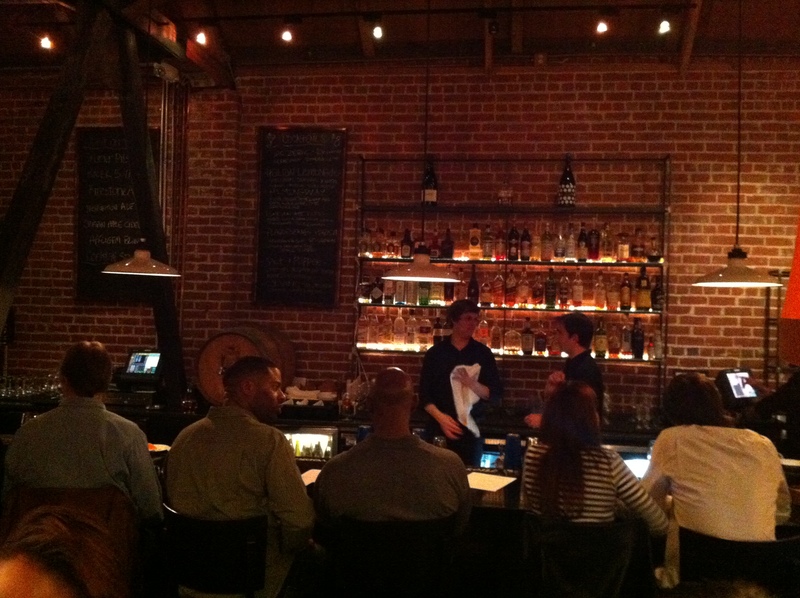 This entry was posted in Food and tagged bistro, casual, food, neighborhood, Sacramento. Bookmark the permalink.